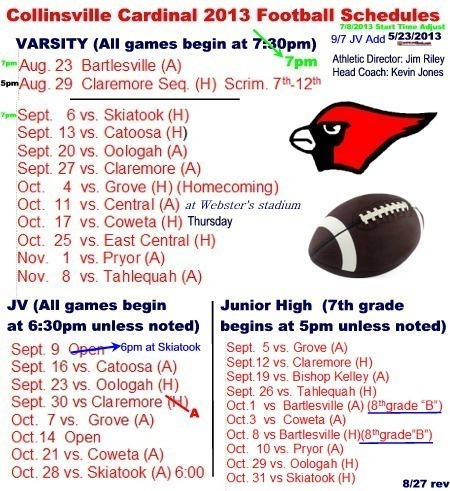 -- Ted Note: This is a Thursday scrimmage with the 7th grade starting at 4pm -vs- Claremore Sequoyah & Nowata. The varsity traveled to Bartlesville August 23rd for the first scrimmage. 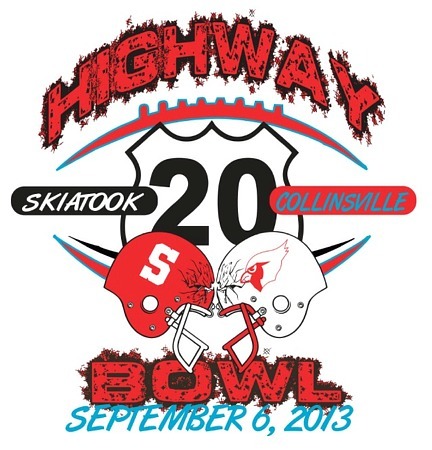 The first regular season game is here Friday September 6th -vs- Skiatook. Pre-paid orders due by Wednesday August 28th. 2013 CHS Varsity Football -- (L-R) Front Row 1: Marcus Tillman (24), Shaefer Smith (49), Kutler Cole (60), Raymond Smith (50), Colin Ford (62), Josh Arnold (43), Ryan LeCrone (8), Colton Connover (53), Jackson Due (57), Conner Kitch (71), Shawn Koscheski (1), and Ryan Haymaker (25). Row 2: Conner Cross (79), Coach Mike McClure, Coach Dale Harp, Intern Coach Burgess Shaw, Coach Sean Tesar, Coach Adam Hass, Coach Ben Davis, Head Coach Kevin Jones, Coach Damon Herald, Coach Robert Sparks, Coach Ben Davison, Coach Jon Benham, Coach Tom Redding, and Keenan Priddy (21). Row 3: Stephen Wilson, Jordan Caruthers (22), Jake Douglass (56), Justin Kothe (45), Roc Robbins (44), Cole Keim (67), Dakota Tredway (52), Hunter Stephenson (72), Chris Kallin (54), Keenan Hamilton (20), Brayden Harris (74), Zane McElroy (4), T.J. Johnson (6), Hunter Rush (5), and Sam West (82). Back Row 4: Paige Foret (manager), Will Proctor (manager), Gates McNeil (manager), Parker Brown (55), Marcus Redwine (3), Kenny Smith (16),Tristan Castillo (87), Tyler Forrest (81), Austin Roberts (23), Dylan Cook (18), Brandon Lowe (2), Patrick O'Neal (27), Zach Hubbard (manager), and Megan Royal (manager). Front Row: Sydney Smith, Madison West, and Taylor Townsend. Middle Row: Mariah Hawkins, Carlie Crutchfield, Chelsey Barton, Montana Trost, Paige Thomason, Hayden Brown, and Tiffant Trimble. Back Row: Mallory Burd, Courtney Tairent, Shelby Braley, Sydney Vogel, Emily Tate, Lacie Crabb, and Baylee Eigenheer. 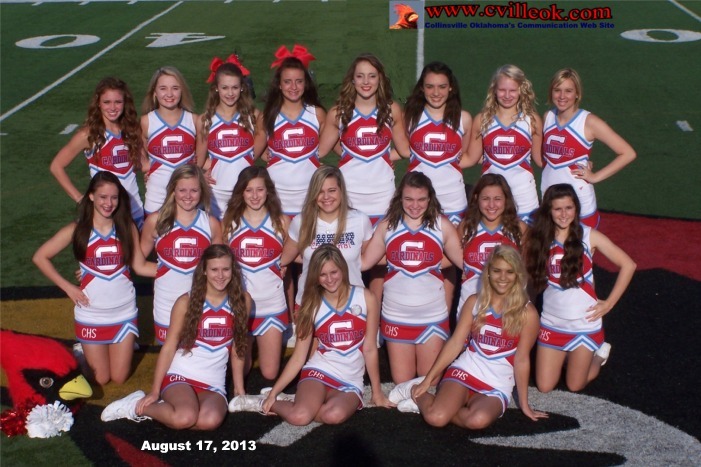 2013 CHS Freshman Football -- (L-R) Front Row 1: Cheerleaders: Shelby Braley, Sydney Vogel, and Emily Tate. Row 2: Allen Tyler (59), Jackson Wilson (61), Brett Erickson (11), Dylan Russell (41), Justin Prather (13), Colton Cates (77), Ryce Haymaker (14), Brody Barclay (15), Ethan Pendergrass (30), and Ian Davis (82). Row 3: Nick Jensen (63), Matt Proctor (76), Triston Flynn (53), Chase Lorg (88), Seth Boomer (12), Tyler Choate (33), Jacob Harrison (51), Levi Draper (7), Blake Burd (26), Dillon Spencer (32), Brannon Jordan (9), and Dalton Price (98). Back Row 4: Bradley Smith (73), Nick Moore (54), Chandler Cole (10), Nathan Schaffner (58), Joey Krupinski (55), Ryan Soloman (68), Tim Caputo (78), and Joey Webber (52). Missed Photo: Ethen Stoots (31), Elijah Tanner (35), Tyler Ramirez (38), Marcus Reeder (38), Ben Her (42), and Cameron Richardson. 2013 Football Seniors -- (L-R) Front Row 1: Patrick O'Neal (27), Parker Brown (55), Dylan Cook (18), Coach Kevin Jones, Kenny Smith (16), and Keenan Priddy (21). Front Row 2: Colton Connover (53), Jackson Due (57), T.J. Johnson (6), Zane McElroy (4), Keenan Hamilton (20), and Cole Keim (67). Sydney Smith, Taylor Townsend, and Madison West. Zach Hubbard (left) and Will Proctor (right) are the 2013 senior members of the manager / trainer crew.